In 1996 NASA started work on the “Robonaut” project. It was designed to resemble a human and created to aid astronauts in space – with the ability to perform the same tasks as a person. According to NASA, a Robonaut can help out on the International Space Station and explore other worlds. 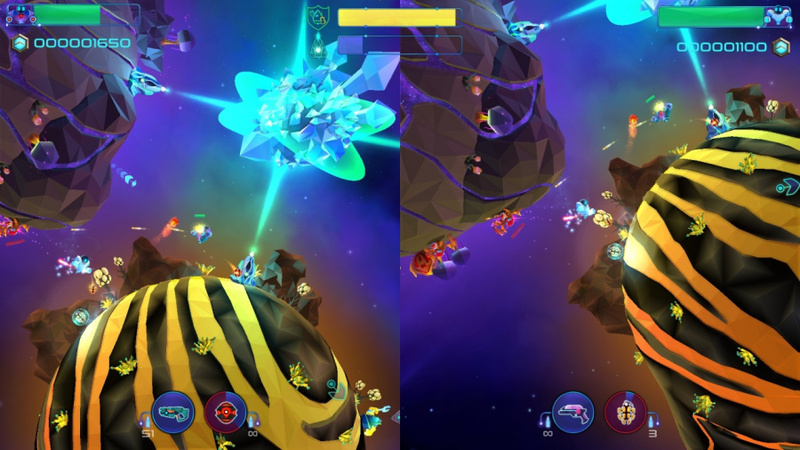 Robonauts by QubicGames – the Polish company also responsible for the upcoming Astro Bears Party on the Switch eShop – appears to draw some inspiration from this project, and is focused on a tiny worker robot planet hopping as it blasts every alien threat in sight. One day, “ROBO” decides to hop into a gigantic mech suit and leave its space station behind. Due to unforeseen circumstances, the robot crash lands on a deserted but seemingly hostile planet with plenty of alien life. It is now up to the player along with the assistance of a stylish robot named El Supremo - who tasks the smaller robot with important missions – to help out. 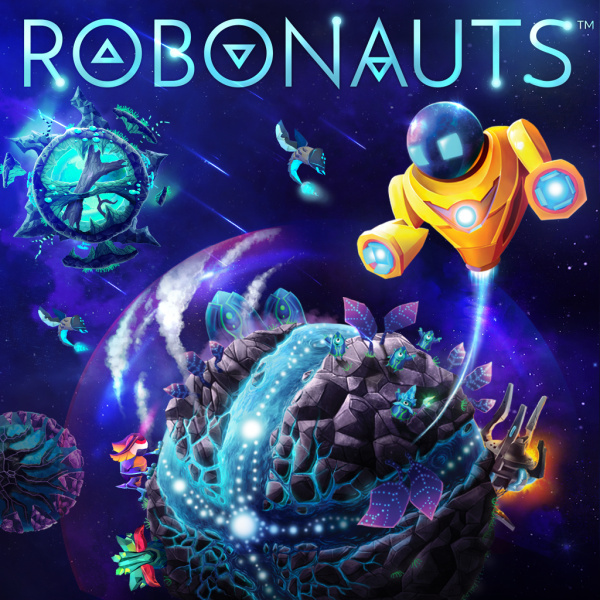 Robonauts draws inspiration from classic arcade shooters and also includes basic platform game elements. ROBO has a primary and secondary weapon slot for shooting, along with the ability to jump from one planet to another with the press of the X button. 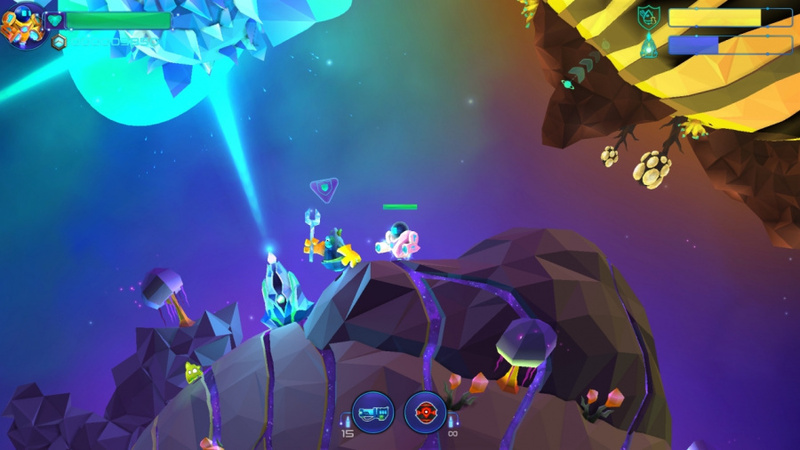 The planet hopping is the standout concept in Robonauts. The action takes place across 12 levels of different sizes, with the size of a level depending on how many planets there are. ROBO moves around each planet shooting every alien life form in sight with its endless supply of weaponry. The planet hopping concept is one that we’ve seen before on a much grander scale, and it is capable of working quite well at any level when properly executed. Thankfully, the quality design of Robonauts makes this core mechanic fun. With the ability to switch gravity at the press of a button, the action becomes increasingly frantic as you move ROBO around planets of different shapes and sizes, shooting weird creatures and attempting to keep the chaos under control. Each level expands on the initial idea of blasting alien creatures by introducing a diverse range of mission objectives that must be completed before you can escape. These become progressively harder over time. Some missions require you to simply destroy everything in sight, whereas others have you blowing up or defending important devices within a certain time frame. The odds often feel stacked against you, and this can be even more challenging if you are playing on the hard difficulty setting rather than the normal one. Many of these missions demand that you micro-manage; for example, you might be required to destroy a bunch of alien nests while also eliminating multiple waves of creatures at the same time. Each enemy in Robonauts looks different and has its own pattern of movement. There are creatures that resemble wasps, crab-like aliens that scuttle along the ground and even “Rampers” which are best described as Triceratops that can shoot laser beams. These creatures deal a lot of damage; Boss enemies can also be a hassle. Fortunately, green extraterrestrial blobs called “Bloobs” appear when you defeat your foe, and these can be collected to replenish the robot’s health bar. These pick-ups often aren’t satisfactory enough, meaning you’ll need to make the best possible use of your weapons. These weapons are based on the types of guns featured in a standard arcade shooter. There are rocket launchers, timed mines, molotov cocktails, cluster missiles, and regular single shot and fully automatic blasters. One minor issue regarding the weapons is how ROBO has a habit of collecting any primary or secondary drop nearby, often replacing a vastly superior or preferred one that is already equipped. On a more positive note, all of the weapons auto-lock onto targets, and for the sake of convenience you can simply hold down the buttons on the controller to continually spray enemies. This doesn’t necessarily make levels any easier as you will still need to be able to out manoeuvre countless waves in order to survive. Even with the challenging play style in consideration, slaughtering millions of alien creatures for minutes or hours on end may not necessarily be entertaining enough for everyone. To counter this, there are other incentives attempting to draw the player in – with a score multiplier that pops up during runs as well as a built in achievement system acknowledging impressive plays. 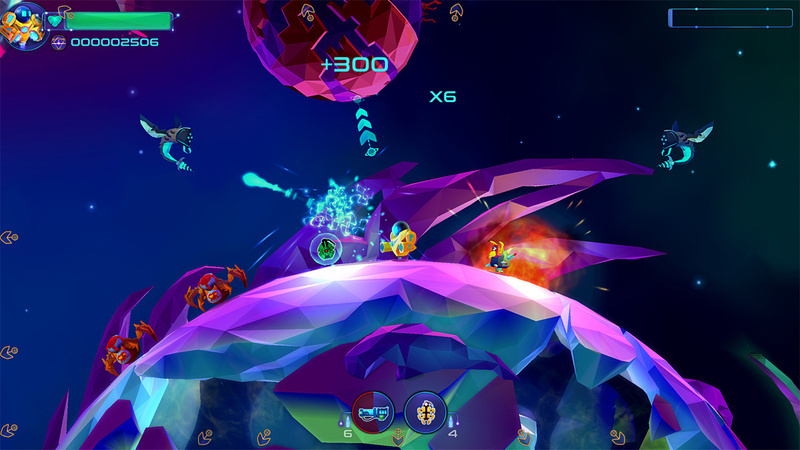 Alongside the single player campaign is a co-operative mode and a two player versus mode. In cooperation each player selects a coloured robot and then both jump right into the game’s campaign. In this mode, if your team mate goes down you have twenty seconds to revive them or it is game over. Enemy waves in this are increased and the action is fast and frantic. A consistent frame rate is also maintained; the multiplayer holds up just as well when the Switch is removed from the dock. In the “Hunting Grounds” mode there are a selection of levels and modes to choose from. There are basic objectives such as eliminating as many enemies as possible to see who can build up a higher score and other modifiers change each session – like toxic planets that deplete the life gauge of each robot over time. The co-operative mode is the more enjoyable of the two, with the ability to play through the campaign in a calculated or chaotic way with family or friends. Visually, outer space has never looked so bright, with purple and aqua colours lighting up the sky as ROBO jumps across the patterned planets. Every creature is colour-coded so you can shoot first and ask questions later. 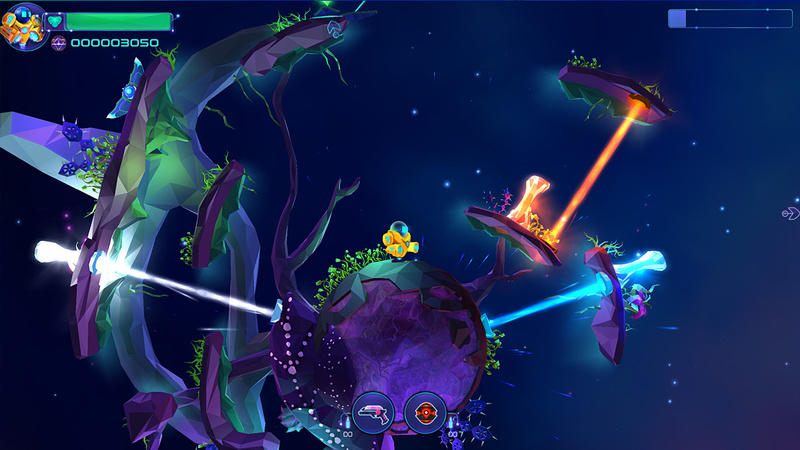 There are also a lot of wild neon colours in the form of weapon blasts and explosions that add extra light to each level. Although the game is presented on a 2D plane, the 3D models for characters, creatures and environments make everything pop. When the Switch is not docked the game performs just as well, if not better. The soundtrack in Robonauts was composed by Simon Viklund, whose past work includes the PAYDAY franchise and Bionic Commando Rearmed. Dance and club songs make jumping about the planets an action-packed experience. The sound effects aren’t quite as good but get the job done, with noises everyone would want to hear coming from blasters and a robot. Robonauts reworks the conventions of a classic arcade shooter by pairing the timeless genre with basic platform game action. The pick up and play nature also remains intact. With two difficulties and some challenging objectives, this game is no pushover. 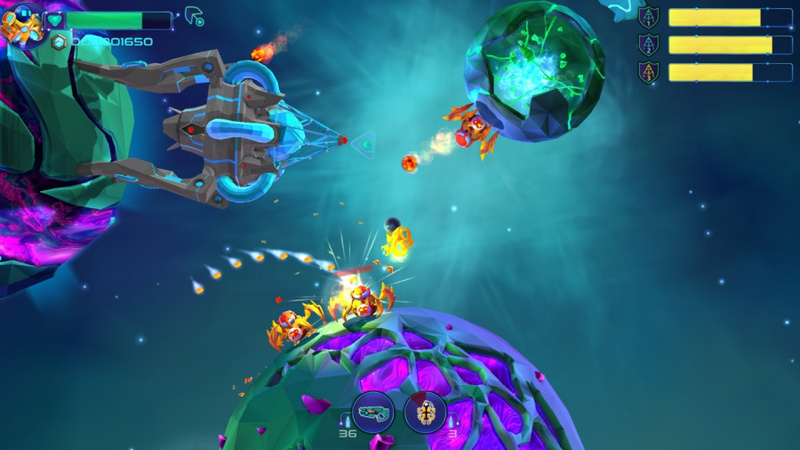 Unfortunately, one shortcoming of arcade shooters is often the repetition that comes with eliminating wave after wave of enemies, and Robonauts is not exempt from this. Still, it is a well-crafted Nintendo Switch eShop game that could provide fun play sessions in-between bigger releases, and even a new co-op experience for family and friends. What a weird price, Im interested but speaking honestly would probably miss this one. Steamworld Dig 2 and Metroid is enough for now. To the wishlist! I'll probably add this to my collection. Looks similar to Graceful Explosion Machine, and I really enjoy that one. If this was ten bucks, I'd be in, but given the backlog and upcoming torrent of games (I'm at 30+ Switch games, and haven't beaten half of them, never mind what I have on Steam) I'll wait, even though this sounds right up my alley. Add it to the list. Too many games on my wishlist!! I guess but not something that peeks my interests and I like shooters. Great review! I may have to check this one out. @MrKai My thoughts exactly! This score does not make sense when you read the review. The mini-planet gravity platforming reminds me of AIRSCAPE, for PC and Mac, worth a look if you like this sub-genre. The graphics look great and the play style sounds intriguing. Its on the wish list. Yep, I don't come here for ratings they just don't know how to score things here. At least the sister site with the PS4 scores things well. It makes sense for them not to currently rate the game though. If/when the patch comes, then the rating would be off because the problems that exist currently make it unplayable and they have addressed that. However, once the patch comes and has fixed the problems that plague the game, that would be the time to let those interested know how the game stands up. They even said they would most likely recommend it once the problems are corrected so the lack of a rating is justified in that case. There's also the fact most reviewers don't review a game after patches to reflect the current state of a game. This game reminds me a lot of Scram Kitty on Wii U. I thought that was pretty fun, so I might look into this. might have to give this one a look.... wasn't even on my radar before reading this! To be fair to the reviewers, reviews aren't about awarding 10/10 if there are no flaws. Some games just aren't fundamentally interesting enough to get higher than a certain score, whereas some very flawed games are so appealing they deserve a high score anyway. I'm not saying Robonauts isn't interesting; just giving a general thought. Have been playing this for the past week. Don't miss out on this game, especially if you want a good 2-player co-op or vs game. The music is fantastic! I'm interested in Any game with an arcade style retro feel. I'll keep an eye on this one! I'm loving this game, for both it's fast-paced Contra-meets Mario Galaxy action and the gorgeous aesthetics. 8/10 for me. My major issue is that I keep playing the same levels over and over again trying to get the best medal... when that happens I almost never actually beat the game. Just saw this on the eshop and was curious about the review. I'm not a fan of arcade shooters (because they're repetitive), but this one is actually interesting because of the Mario-Galaxy-factor, the artstyle and the music.